The Dafne Schippersbrug looking west to the city centre. For over half a century, the west edge of Utrecht was clearly marked by the Amsterdam-Rhine Canal and the A2 Motorway to the west of it. In the 1990s, when Utrecht made the jump over the canal with the new housing area Leidsche Rijn (that will house 100,000 people when it is all finished) it was already clear that these barriers had to be removed somehow. Between 2007 and 2012 the A2 motorway was buried underground, that meant one barrier fewer. Discussions about a cycle bridge over the canal had already started in the late 1990s, but at the most logical location for a cycle bridge two schools were in the way. In November 2013, the city council finally decided that one of those schools should be relocated and the other would be integrated into a bridge. With that bridge now in use, all barriers were indeed removed. The two school buildings between Victor Hugoplantsoen (Victor Hugo Garden) and the canal were not only in the way of the projected bridge, they were also old and owned by the city. That made it possible to solve two problems at once. 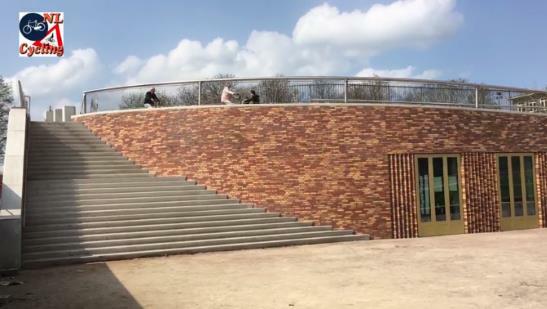 For one of the schools a new building was built on the other side of the canal, in the new residential area, the other, a primary school, got a brand-new building at the former location, but with the access ramp to the new bridge on its roof. Building started in May 2015, the new school has been in use from 9 May 2016. The former school at the end of the street (Everhard Meijsterlaan). Behind it was an identical second school building and behind that was the canal. Picture Google StreetView, 2009. 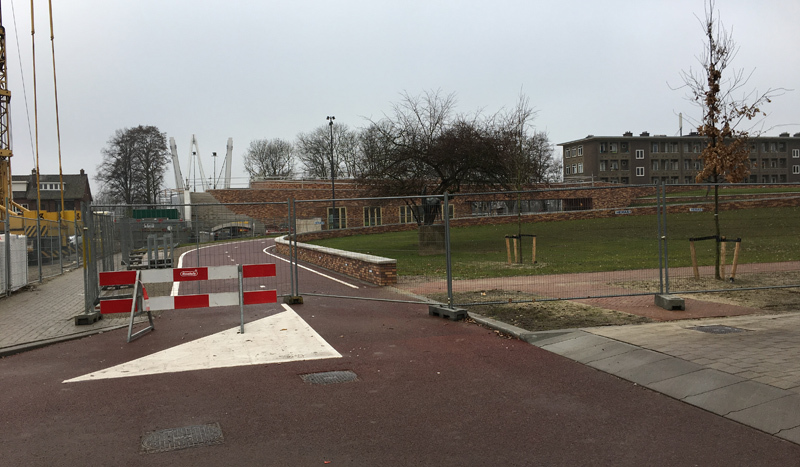 The same location shows the new school with the integrated bicycle ramp on its roof, a few weeks before the opening of the bridge, of which you can see the pylons in the distance. The access ramp onto the school had to make a curve. 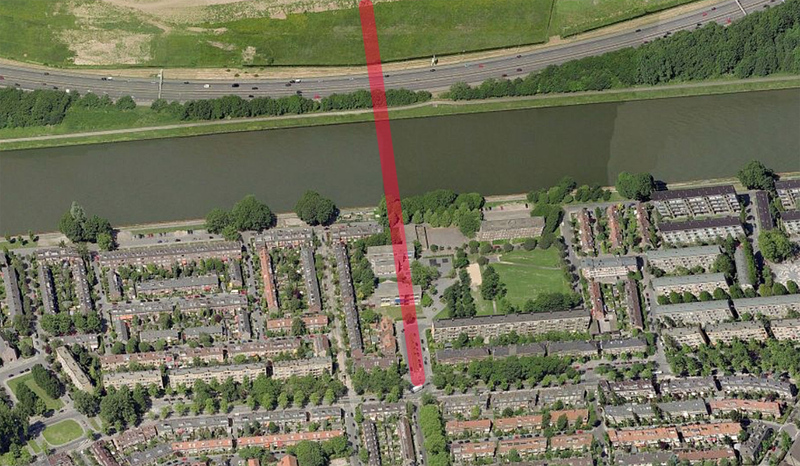 There was not enough space between the bridge and a main road (that the cycle route crosses) to have a straight ramp. Because of the curve, the gradient of the ramp is on average just 2.6%, with a maximum of 4% at some locations. There is also a level part to catch your breath. That means the ramp can be used by almost everyone. The public garden around the curved bicycle access ramp was re-designed. Thanks to the clever double land use there was even space left to develop a row of 15 new houses. That means there are a lot of elements in this project: the relocation of the two schools, the bridge, the garden and the houses. All together it required an investment of 25 million euros. If you want to single out the cost of just the bridge: that was 7 million euros. Aerial picture taken just before the opening of the bridge (that had no red asphalt yet). The new row of houses under construction is clearly visible. Picture courtesy of Mastum Daksystemen/Leven op Daken/Maurice Iseger/Burgcopters. Cross section of the bridge and the school (right). Picture Next Architects. The access ramp is very special, but the bridge itself is also impressive. It is a 110 metres long suspension bridge also designed by Next Architects. The west pylon was erected in September 2016. It is meant to stand out as a new landmark at 35 metres tall. The east pylon is supposed to blend in with an existing row of trees and it was therefore kept at 20 metres tall. The suspension cables were connected in one weekend to disturb the busy ship traffic as little as possible. The bridge deck (at 9 metres over the water) consists of 10 pre-fabricated parts that were also placed in one weekend. These deck parts were then connected while the many ships could already use the canal again. The bridge deck is 7 metres wide. The cycleway on the bridge is 4 metres wide, the footpath 2 metres and there is 50 centimetres on either side for the fences and other rest space. After the bridge deck was completely closed, the contractors could finish the bridge, by placing the railings and the final top layers of asphalt. This took a bit longer than expected and the winter temperatures meant a further delay of about 3 months. But on Monday 3 April 2017, at 8:00 am sharp, the fences were removed and people could use the bridge. Right away they did, in great numbers. It is expected that 7,000 people will cycle across the bridge daily. 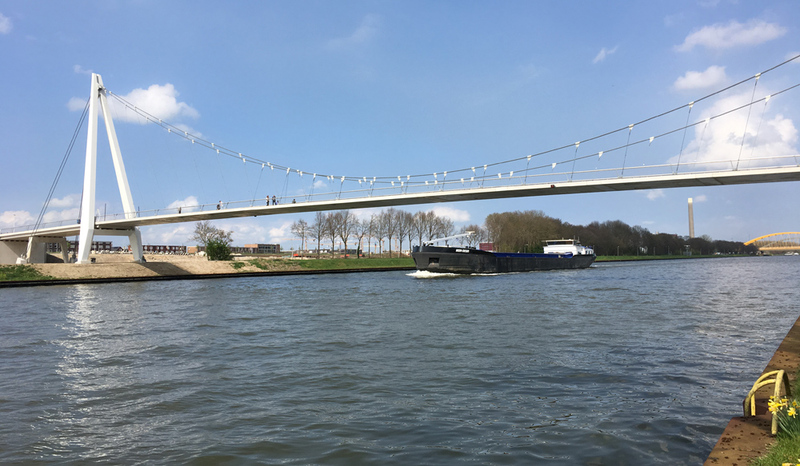 This bridge is not a token piece of infrastructure, it is a very important connection in the Utrecht city cycle network. 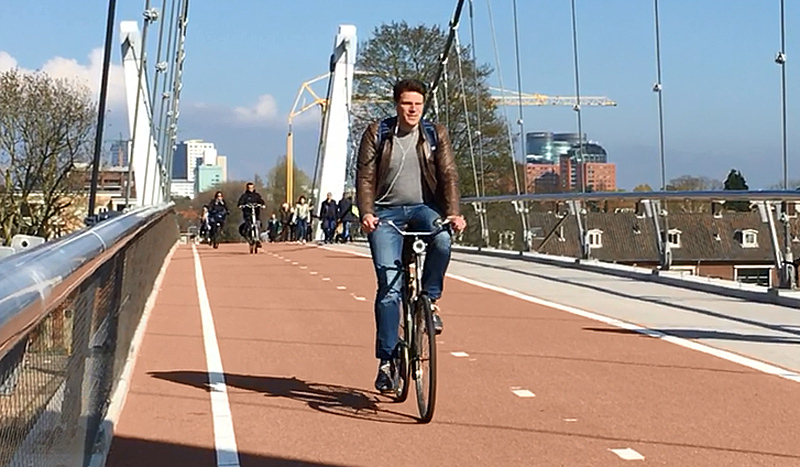 The video, showing a ride from Leidsche Rijn to the Utrecht Central Station, shows you how useful this bridge is. The bridge under construction. The 10 pre-fabricated decks had just been placed. The city of Utrecht asked its residents to name the bridge. This was in 2015 just after Utrecht athlete Dafne Schippers had become world champion at the 200-metres, a first for the Netherlands. 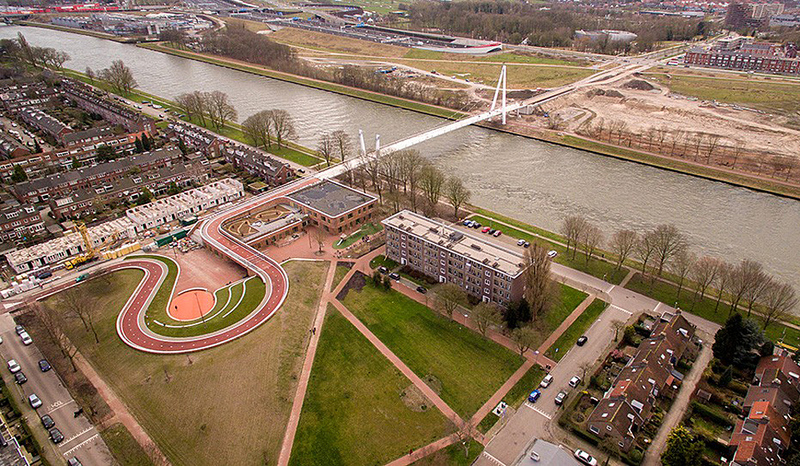 Almost 2,000 people proposed to name the bridge after Dafne Schippers, not only because the bridge is a fast connection, but also because she lives in the neighbourhood and went to school in the new development. This was a fortunate decission, because that meant the Netherlands was spared a third Snelbinder (after Nijmegen and Naaldwijk). That name was also chosen very often! Dafne Schippers will personally open the bridge named after her, on 13 May 2017, in an official opening ceremony. 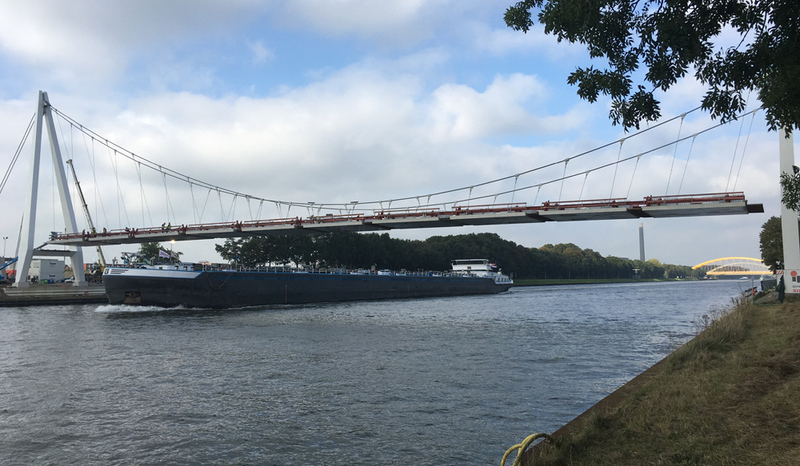 My video report of the new “Dafne Schippersbrug”. Left to right the route to the city centre that I take in the videos. (Starting at the same point of this earlier post.) You cross three major roads, but you see little motor traffic on the route itself. Part of this route is on the cycle street of Leidseweg that was opened last year. I cycled the 3.2km in about 12 minutes. A leisurely 16km/h. (Picture from the Cyclists’ Union route planner, that was already updated 2 hours after the bridge was opened!) Top and bottom of the picture the two nearest bridges, circa 2 kilometres apart. These bridges are for all types of traffic and already had good protected cycling infrastructure. The bridge made international head lines: 1, 2, 3, 4, 5, 6. The builders placed a nice drone video when it was almost finished. Sped up video looked so dangerous! Like need for speed. When I used to live in Leiden in the 90´s I cycled along the Rhine to Utrecht, Varkensmarkt. Infrastructure definitely was not as good as nowadays. Many years later now, my daughter lives in Utrecht delivering meals to people on an electrical bike. There is progress in the World indeed. Great explanatory post with a nice, quiet ride to enjoy vicariously from the couch. I recognised other streets in the video route that had appeared on previous blogposts; was the whole route from Leidsche Rijn to the city centre planned to be upgraded in anticipation of the new bridge being opened? (I expect it was). And all that new infrastructure for only 25 million Euro – a bargain! I would like to ask you: I bicycled from The Netherlands into Belgium. I noticed that the countries are very similar in all respects but the people are very different. In The Netherlands people are much more outgoing and more “at your service” in the shops. But the amazing thing is it started right after I crossed the border. What causes such a cultural difference? Before you answer you must consider that both border populations are so close to one another without any natural barriers separating them. Yet the population in The Netherlands and Belgium are each nearly the same on the other side of their respective countries (the population in Breda is the same as the population in Groningen but completely different than the population just over the border). How can this be? What causes this? It’s not just the Dutch and the Flemish; it’s the same with people from the province of Noord-Brabant (North of Belgium) and the people from adjacent provinces. I’m from South-Holland and I feel very different from my ‘Southern’ relatives, but the same applies to my relatives in Groningen. Yes, but everyone, everywhere in The Netherlands is distinctly different than the Flemish. My questions is, how can this be when they live so close together, share other cultural similarities without a natural border? Culture is “transmitted” from one person to another. How can it be that it stops at a political border? What cause(s) are responsible for the distinct difference? The Dutch culture is of the Scandinavian type culture. The Flemish culture is Mediterranean culture. The Dutch speak their mind, honest and sometime blunt. The Flemish keep their opinion for themself. In the Netherlands a deal is a deal, but in Flanders the deal is not always kept. One reason for possible differences could be due to the fact that Flanders is largely Catholic, while only the Dutch provinces south of the rivers are Catholic, namely North Brabant and Limburg. While I’m sure the differences within the Netherlands were probably greater in the past, there are still noticeable ones such as with traditions like Carnival. Most of my Dutch colleagues are not from those 2 provinces and they almost unanimously think it’s a strange celebration; some think it’s just downright silly or dumb even. I was surprised you felt that all other aspects were very similar between the two countries. One very noticeable thing for me anytime I go into Belgium is that their roads are much crappier than Dutch ones. Very bumpy, full of potholes at times and in general just not very well structured or organized. The same goes for their residential areas. Dutch houses all look pretty similar and everything is quite organized and well designed, while in Belgium neighboring houses can be completely different and their street layouts just don’t always seem to make since. The Belgians also care more about the quality and taste of food, whereas a lot of my Dutch colleagues just want things as easy and cheap as possible. Personally, I prefer Belgian food to Dutch. Wanna hear me and several other people discuss bicycle infrastructure construction and funding in the Los Angeles area, along with electric bikes? Then listen to this podcast on the link below from April 8th. This was recorded at a non-profit radio station that has no commercials. Indeed the A2 highway has been buried in a tunnel. But now a local multi lane (almost) highway is lying on top of that tunnel. So it is somewhat doubtful whether cyclists are better off with that expensive tunnel. The only difference is that there are more crossings.The drawback is the huge scale of the crossings and the very low priority for the cyclists. In my opinion again a barrier has been created, making all the right reasons to get rid of the A2 in a very expensive tunnel worthless. Do you have any English language links, please Theo? Another fantastic bicycle ride! But I do have one possible concern. On the bridge is that only a single guardrail on each side with open space below and above? That is probably the effect the architects wanted. But the space is not really open. There is a ‘net’ of metal wires. As a Utrecht cyclist, I agree. But other bridges over the ARC haven’t got any fence above waist height either. So if a cyclist falls over the railing, he/ she will fall in the canal. I was quite surprised they named the bridge after Dafne Schippers. I always thought that we didn’t name streets after people still alive unless they are royalty? Yes, that is customary in the Netherlands, but not a law. Utrecht had a precedent with the Anton Geesinkstraat. So named after he won gold at judo in Tokyo in the 1964 Olympics. Anton Geesink lived until 2010, he even had a sports school in the street named after him. I voted for that name because “Schippers” can be interpreted as the (translated) equivalent of boatmaster and therefore making it a bridge for the ships as well. And Dafne of course makes it a fast connection. One of the other options was “Snelbinder”, but that’s already in Nijmegen. On the last link by Treehugger, Lloyd Alter writes: ‘…this one is particularly circuitous. I think if I was a pedestrian I would be a bit cranky going that extra distance, when a stair could take me straight up.’ He probably never noticed the stairs. But it got me thinking how most walking in the Netherlands is more recreational than transportational, when it comes to the longer distances. The bike has taken over that part of short distance transportation. Usually over a distance of say more than 1 kilometer, we tend to take the bike rather than walk it. And, in this case, people out for a stroll probably won’t mind the detour, as it gives them a nice view of the schoolyard and surroundings. At the beginning, there is a typo. Mayor cycle route does not make sense. Major does. It happens to the best of even native English speakers too Mark 😉 Nice bridge. Just goes to show that cycling isn’t just an optional part of the system that can be ignored if there’s no space left. I can’t see a typo either. Also, is this really worthy of public comment? If you feel the need to proof-read an article perhaps it would be more positive and polite to contact the author privately. I didn’t mind. I changed it right away, that’s why it isn’t there anymore. It never ceases to amaze me how good the Dutch people (apparently nearly all of them) are at both speaking and writing English. I am slowly learning to read Dutch, but being that good at it seems a long way off. 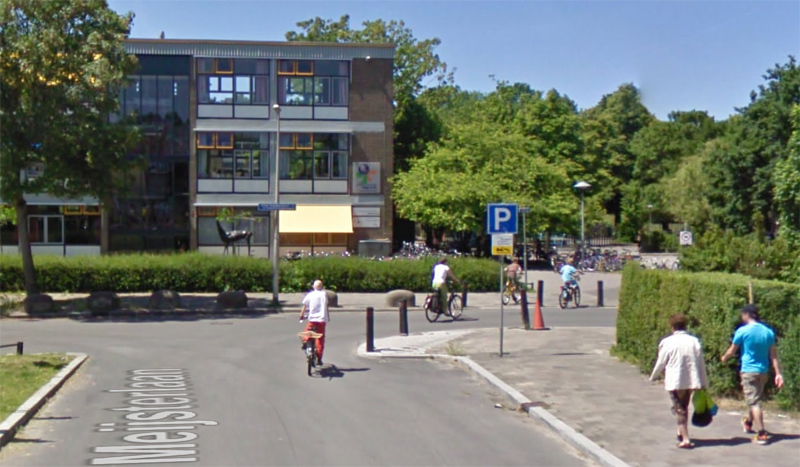 This entry was posted on 11 April 2017 by Bicycle Dutch in Original posts and tagged big bridge, bridge, exceptional cycling infrastructure, school, Utrecht.